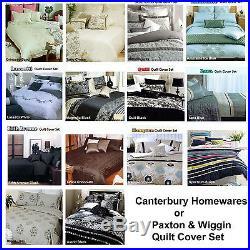 QUALITY Quilt / Doona / Duvet Cover Set Canterbury Homewares or Paxton & Wiggin - DOUBLE QUEEN KING. Add a touch a designer to your bedroom with these stylish Quilt Cover Set by Canterbury Homewares or Paxton & Wiggin. Set Includes: 1 x Quilt Cover Two matching Standard Pillowcases - 48cm x 73cm approximate. Sizing Information : Double - 180cm x 210cm Queen - 210cm x 210cm King - 240cm x 210cm. Design Information by Canterbury Homewares : Orinocco Sand - It features a beautiful trailing floral embroidery design on a Stone / Sand background. All pieces are quality made with Tailored finish. The fabric is amazingly comfort and smooth with a high quality 300 thread count and 100% pure cotton Tarlo Cream - It features a stylish Seersucker Jacquard design on a cream background. This set is quality made & finish with high quality Poly cotton percale reverse. Marielle Grey - It features a layered look print trimmed with satin ribbon in Grey, Silver and White background, Reversible and Satin Ribbon detailing made from quality Polyester Cotton. Amarante Ice Blue - featuring a richly embroidered rose motif on a Arctic Blue background. All pieces are quality made with a luxurious and soft 100% pure cotton 250 Thread Count Sateen. Lassetti White - It features a printed pinstripe and an eleborate embroidered design with a silver metallic outline, all on off white cotton base in 250 thread count made from 100% Cotton. Set is bordered with contrast piping for added appeal Magnolia Black (with a hint of navy) -It features scribble embroidered panels and Taupe with a hint of olive velvet taping in on a luxurious and soft 250 thread count sateen made from quality polyester cotton in Black with a hint of Deep Navy, Silver. Quill Black - It features a striking comtemporary graphic silhouette printed in a 250 thread count ottomon fabric. Bands of sequin trim and rolled piping complete the look on Black and White background made from quality Polyester Cotton. Lara Blue - It features a luxurious faux silk combined with chocolate velvet ribbon, ruched panel detail, embroidery and hand-stitched ribbon trim on Stone, Light Blue background with a Super soft 250 thread count polyester cotton. Fifth Avenue - It features a richly embroidered rose motif on a Arctic Blue background. Design Information by Paxton & Wiggin : Spectrum Stripe - It features vivid stripes in White, Teal, Lemon and Hot Pink on a Navy Blue background with asymmetrical pleating. Set is fully reversible with matching smaller stripe made from poly cotton. Miette Grey -It features a stylized black and silver motifs pattern on a quality Polyester cotton percale in Grey. The reverse is a black & silver horizontal printed stripe. Astrid Black - It features bold and oversized floral print in Biege, White, Purple, Pale Sage green and Light Lemon yellow. Set is complimented with deep pleats reveal layers of Taupe satin ribbon detailing made from quality polyester cotton. Hampton Linen - It features rows of knife pleating amongst trailing floral applique and embroidery from faux silk fabric. Bordered with contrasting flat piping, it features a palette of softened blue and navy upon a stone background. The reverse is made from easy care poly cotton. Taffeta Chocolate - It features an exquisite trailing floral appliques with bronze metallic embroidery on a Chocolate background. The face fabric is a luxurious taffeta and an easy care quality poly cotton percale reverse which requires little or no iron at all. Care Instructions: Machine Washable See label for detailed instructions before first use. Check out our other items. Note: Please be aware that while every effort is made to display colours and textures accurately, there may be some variations depending on the settings of your monitor. Note to International buyers: A Quilt Cover is also known as Duvet Cover or Comforter Cover. Feedback: Feedback is appreciated and left for our customers. We are committed to resolving any issue to make you a happy customer. The item "Quilt / Duvet Cover Set Canterbury Homewares / Paxton & Wiggin DOUBLE QUEEN KING" is in sale since Saturday, February 07, 2015. This item is in the category "Home & Garden\Bedding\Quilt Covers". The seller is "manchesterplus" and is located in Dandenong, VIC.